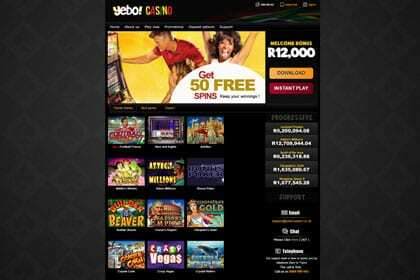 Yebo casino surely is one of the best South African online gambling casinos. This is mainly due to the fact that this casino is adapted to South African rainbow realities and also by the quality of their fantastic range of games, promotions and services provided. Their software, developed by real time Gaming (RTG), which no longer needs any introduction in the gaming world, can be downloaded quickly (takes only few seconds) you can directly play on their website in their excellent flash version if you do not want to download the casino; or you can simply use the mobile version. With more than 200 games, you will not grow tired as there are games to meet your preferences and tastes. We enjoyed playing on their online video slots and tables games such as European and American roulette and blackjack. There are different welcome bonus packages adapted to each player’s game preferences rewarding players on their first 3 deposits; adding to this their great 24/7 support service and the wide range of their fast banking payments methods makes Yebo casino the online casino where you will feel at ease and able to enjoy fully the benefits of an online game. Deposit Options: Visa & Master Card, Neteller, Moneybookers, Ecocard, PaySafe Card, Bank Wire. No deposit Bonus: 50 free spins, no deposit required. Contact support to claim. Yebo casino ensure that every bet you make brings you value in the casino through our VIP program. Yebo casino’s VIP program is divided into 4 categories and player can enjoy particular advantages linked to each level going from new, bronze, silver, and gold to platinum. To maintain or pass to the higher category, a player is required to accumulate or maintain a certain number of loyalty points over a 3 months period.